Ronan O'Snodaigh of Kila answers below the questions CLUAS put to all 10 acts nominated for the 2007 Choice Music Award. Check out the answers from the other nominated acts. 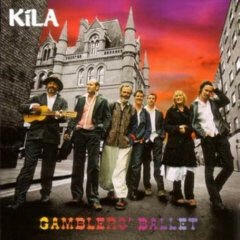 Gamblers Ballet came about through a game of poker and all our instruments got lost in the poker, Colm won the pipes, I won the bass guitar, Rossa won the kit but lost his bouzouki and lance won an empty fridge from the rider... and Brian had to dance a ballet naked coz he'd no bass, which led us to the idea that recording an album would be a better business proposition than playing poker!! They are great when you get them. Maybe the band will start saluting each other if we win award. It might be more fun if everyone gave up working and just made music. Scenes are something you make so it is up to the individuals to make it brilliant. Us at the Electric Picnic, didn't get much time off to see other people last year unfortunately. To become a bulti-billionaire, play another game of poker with real stakes and try to win back my bodhran!! It makes everything more accessible, it makes it a lot easier to record it produce it and get it out there. as for making more money its not so clear yet. Go to youtube.com and watch Joan Armatrading, Willow and Bill Withers often.